A scarce macroeconomic calendar and relevant data scheduled for later this week, kept the pair ranging. EUR/USD bulls to lose the grip if the 1.1245 support gives up. 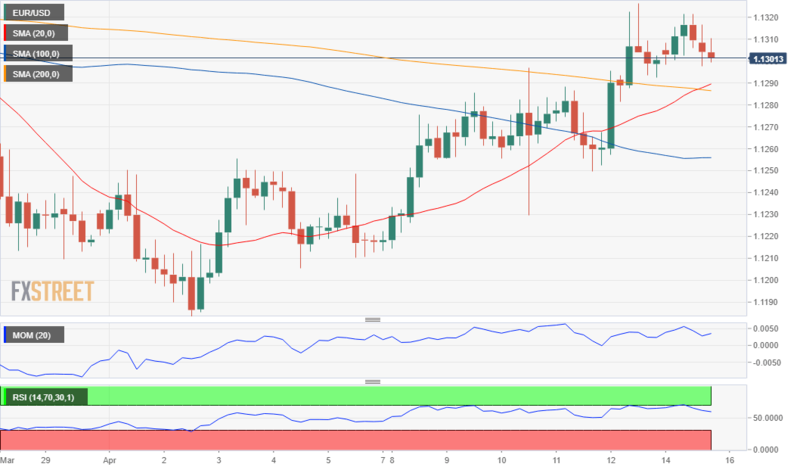 The EUR/USD pair posted a modest intraday advance, remaining confined throughout this Monday to a tight 30 pips' range, finishing it barely up at around the 1.1300 level. The pair advanced up to 1.1320 at the beginning of the day, as risk-on mood from late last week prevailed, although the absence of relevant macroeconomic data kept market movements limited. The pair eased with Wall Street's opening as US indexes traded in the red but held well above 1.1285, the 38.2% retracement of the 1.1447/1.1183 decline and the immediate support. Limiting EUR's gains, the German's Bundesbank monthly report indicated that the country's economy grew moderately in the first quarter of the year, adding that the underlying growth trend remains subdued, hardly a news, but still weighing on the shared currency. The US published the preliminary NY Empire State Manufacturing Index for April, which resulted at 10.1 vs. the expected 6.0, also well above the previous one. Tuesday will bring the German ZEW survey for April, with the economic sentiment expected to have improved in the country and the Union. The EU will release February Construction Output, while the US will unveil March Capacity Utilization and Industrial Production, seen little changed when compared to the previous month. Range trading may continue ahead of Thursday when both economies will publish more relevant figures. The pair heads into the Asian session still trapped between Fibonacci levels, yet at the upper end of these last days' range, suggesting bulls are still outpacing bears. In the 4 hours chart, the pair is trading above moving averages, and with the 20 SMA extending its advance above the 100 SMA and about to surpass the 200 SMA, usually a sign of directional gains ahead. Technical indicators in the mentioned chart eased within positive levels, rather reflecting the lack of follow-through than suggesting an upcoming decline. The risk of a short-term bearish corrective movement will increase on a break below 1.1285, while bulls will be more willing to give up if the decline extends below 1.1245, the next Fibonacci support.